The Final Cut by Catherine Coulter and J.T. Ellison is the first in a new series of FBI thrillers starring Englishman-turned-FBI-Agent Nicholas Drummond (available September 17, 2013). I always find it fascinating when two authors work together. The temptation to pick a book apart, try to find the bits written by one author or another is almost irresistible. The Final Cut is a fairly seamless read, but—as I probably should have guessed from the size of the names on the cover—there's a whole lot more Coulter than Ellison. In fact, I think this is a book that Coulter fans will really enjoy, because although it introduces Nicholas Drummond, old friends Sherlock and Savich still get plenty of airtime. So where is Ellison in all this? Well, I suspect she's responsible, at least in great part, for Michaela “Mike” Caine, Drummond's FBI partner. First, a little background: Detective Chief Inspector Nicholas Drummond is American by birth, but has lived most of his life in England, spending time in the armed forces before joining the police. He returns to America when Inspector Elaine York, a colleague and former lover, is murdered in New York City, where she was living as “minder” for the crown jewels, which are to be displayed at the Metropolitan Museum of Art. Elaine's death is not the only issue at hand, however. Nicholas soon finds out that the Koh-i-Noor diamond has been stolen and he calls in every favor he can to be assigned as a consultant. He is partnered with FBI Agent Mike Caine in an attempt to prevent an international incident over the theft. I must admit to knowing little about the history of the Koh-i-Noor before reading this book, so the details fascinated me. I knew about the cutting, the reduction in size, but I didn't, for example, know about the curse. Ah, a diamond just for women. Naturally, a woman has stolen it. And just as naturally, she's done it because a man asked her. He'd had a shower, too. His hair was still damp, and he smelled good. Unlike her, in her anonymous bathrobe, he looked as sleek as a panther in a black zipper-neck sweater and gray wool trousers. Where did he stash all these wonderful clothes? He had to be coming to the bottom of this bespoke carry-on. A tray was on the table with a variety of cheeses, bread, and fruit. A bottle of wine was open, but she ignored his offer of a glass and instead poured herself some water. “That you didn't dream,” she said, and grabbed her bag and carried it to her room. I think Drummond and Caine will probably be an entertaining series, though I admit I selfishly hope Ellison gets a greater hand in the style of the writing. I think Coulter plots a fun tale, but her head-hopping tends to leave me a bit dizzy. So I'll give the next one of these a shot and see how the series progresses! Laura K. Curtis lives in Westchester, NY, with her husband and two madcap Irish Terriers who’ve taught her how easily love can co-exist with the desire to kill. She can also be found at Women of Mystery and on Twitter. Her first novel, Twisted, will be out in November, 2013. %*#$! in Peace: The Most Vicious Obituary? Thanks for a great post. I’m a Catherine Coulter fan but have never read J.T. Ellison. 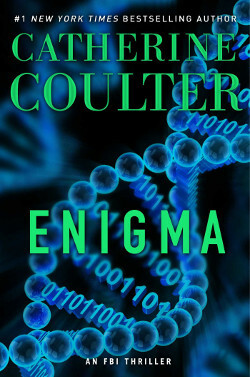 I am a fan of both Coulter and Ellison and have been looking forward to this book/series. Now I just have to save my pennies!! Appreciate your comments.